An educational institution accredited by a government agency within its applicable local, state, provincial, federal, or national government and has the primary purpose of teaching students. Non-accredited educational institutions are specifically excluded. No. School licenses are non-expiring. Support & Software Assurance (SSA) does expire and does not affect the software license (SSA provides services for upgrades, video access, library catalog downloads and technical support). Student License — How do I qualify? Students can apply for a 1 year student license by filling out our Student License Application. Students must provide proof of enrollment in a minimum of 3 credits in building related coursework. Proof may be in the form of an official school schedule or transcript. The educational institution must meet the requirements of a Qualified Educational Institution, as outlined above. Home school programs which belong to a nationally recognized home schooling body or recognized by a local school governing body as an acceptable alternative to an accredited educational institution may qualify for a student license. If you are a Home School, please provide the documentation with your student license application. Yes. Student licenses expire 1 year from date of purchase. Students can apply for a subsequent year(s) subject to student license requirements. Can Academic (School or Student) licenses be used for commercial use? No. The academic software license is discounted for the purposes of educational use only. The software includes an academic watermark. 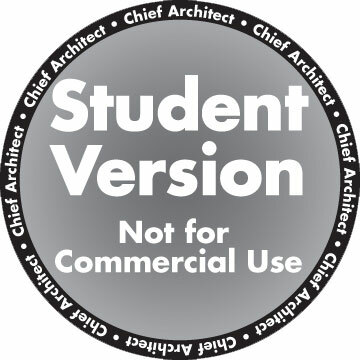 Which version of Chief Architect do schools and students receive? Academic and Student Licenses are based on the Premier Version of Chief Architect. Is the software limited in any way? The Academic and Student versions are full, working, versions. Layout pages include a watermark: "Not for Commercial Use". Can I sell an Academic license? Academic & Student versions cannot be transferred or sold. Can the software run on a network? Yes, School Lab Packs are designed for network environments. Does the software require the use of a hardware lock? No, the license runs with a Software Lock Security. How is the software delivered after purchase? What do I receive? The software is provided via electronic download for installation. Manuals and documentation are electronic. Hardcopy manuals and backup media can be purchased separately. Visit the Add-On Products page. Chief Architect runs on Mac & Windows systems. Internet access is required for installation, license authentication, deactivation and video & library catalog access. Please visit our System Requirements page for detailed specifications.